The Barkann Family Healing Hearts Foundation would like to invite you and your family to The Day We Remember Walk & Run on Saturday, September 16th at Neshaminy High School in Langhorne, Bucks County. The image above shows the course map for the run and walk. You can also download an animated PowerPoint document to help understand the overlapping aspects of the course. Once downloaded, “Show/Start Slideshow” to view the animated course. A limited number of photo tickets will be available. Must also register for Walk or Run to purchase a Photo Ticket with Celebrity Host. 50 Students who register for the Walk or Run will randomly be chosen in a Raffle to have their photo taken with the Celebrity Host! On September 11th, 2001 the lives of Americans were changed forever. To commemorate the attacks of September 11th, The Barkann Family Healing Hearts Foundation would like to welcome the local community to honor the memories of those who were lost, and to continue to strengthen our resolve as a community to foster the most basic ideals of freedom and equality. Over the last three years, The Barkann Foundation has hosted The Day Philly Remembers Walk & Run at the Philadelphia Zoo. The event has been a huge success thanks to our loyal supporters and our Healing Hearts Family. Our Foundation team felt very strongly that we should bring this very special event to the local community this fall. 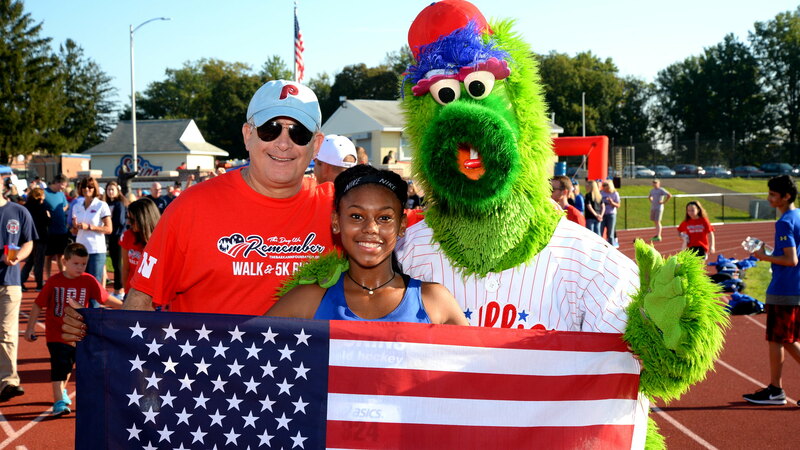 We are thrilled that the Administration and Students at Neshaminy High School have gone above and beyond to accommodate and host The Day We Remember Walk & Run on Saturday morning, October 1st. Neshaminy High School and Middle School Students have volunteered their time at several Foundation events over the last few years. We continue to be inspired by Neshaminy’s strong overarching expectation to build each student’s future in the classroom and with their commitment to community service. On September 12, 2001 we came together as ONE Nation to show our love and appreciation for our HEROES who protect our freedom and sacrifice to ensure our safety in our respective communities and neighborhoods. Please join us as we show our support for our United States Military, local Police and Firefighters, and our First Responders. Our Emcee and Host Michael Barkann will be joined by a Celebrity Host as we Walk & Run together as a community for The Day We Remember. There will be a very special presentation at the conclusion of the Walk & Run, you will see firsthand how your generosity will impact just one of the local families we support throughout the year. We look forward to seeing you and your family for The Barkann Foundation’s Day We Remember Walk & Run. Please wear your Red, White, & Blue! Click the link below to make a donation in support of the OrangeTheory Fitness Team or for more details on how to join the OrangeTheory Fitness Team. Click the link below to view available sponsorship opportunities! View Article on Courier Times! Click the button below to make a general donation. A limited number of photo tickets will be available. Must also register for Walk or Run to purchase a Photo Ticket. Click the link below to make a donation in support of the OrangeTheory Fitness Team or for more details on how to join the Team. You can make a donation, register or purchase tickets using your PayPal account or any major credit card. Paper tickets will not be distributed. Your email receipt is your ticket.